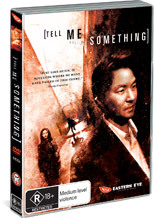 Tell Me Something is the classic cult hit from South Korea which revolves around Detective Cho (Han) who is not only haunted by the death of his mother but is under investigation by Internal Affairs for suspected misconduct. To compound the situation for our lost hero, he receives a strange case involving a serial killer who is leaving black plastic bags across the city with dismembered body parts. As he investigate, he discovers that the victims have been linked to Su-yeon (Shim) who was once their lover and believes that she may be in danger from the killer. Without spoiling Tell Me Something, the movie is reminiscent of Se7en with an Asian twist that has Director Chang questioning the viewer from start to finish as no one seems to be what they are. A classic Asian thriller that puts many Hollywood movies to shame!